In July of 1893, James Hurst, a perfect English gentleman, had retrieved a treasure that would secure the financial future of his family, got scarred by a zombie and lost his virginity to Ira Russell, the treasure hunter he hired. It seemed to be a match made in heaven but back in London, the harsh reality of having a wife and child came crashing into his new found infatuation. 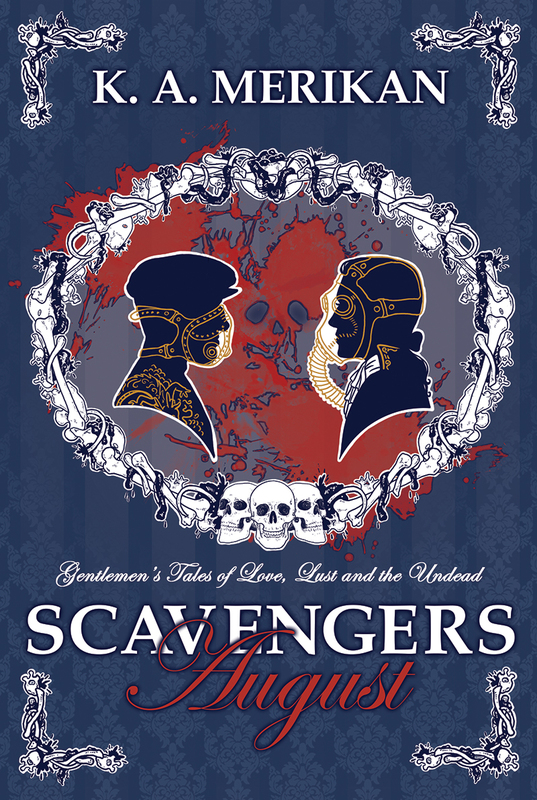 “Scavengers: August” is the second book in a three part series and is set in the universe of “Zombie Gentlemen”. James donned his elegant gas mask made from brown leather, to match his shoes. He was the first one to leave the steam carriage and once outside, he held out his hand to Lady Shelley. Her mask was covered with a layer of nacre and shaped like a canary’s beak. Instead of putting it on, she held it by her face with a silver handle.The woman took James’ hand and exited the coach gracefully. The pavement was relatively clean, so there was no need for her to continue lifting the hem of her dress once she was on the ground. James smiled and they started walking towards a group of men already standing at the top of the marble stairs. He really hoped someone would get Lady Shelley’s attention off him. Five years after the appearance of the new, terrible illness, a professor Hiltrub established the first department of morphysiology in the British Isles, which was second only to the one at a University in Berlin. The new branch of science was concerned exclusively with the physiology of the undead and was supposed to find a cure in the long run. A young professor who was supposed to be their guide in the building was introduced to James as Arthur Fairfax. After a short welcoming talk, the whole group entered the university. James didn’t know much about medicine but as one of the parliament’s representatives, he tried to learn, and inspecting the new department was one way to go about it. One of the conservative lords, Richard Barnett was strongly opposed to this new development, but the majority supported the research in hope of helping the ill and preventing further spread of the Plague. Another major advantage of having undead subjects in a medical faculty was the possibility to learn about the functioning of a human body on a working organism. Undead bodies did work, even though their physiology was much slower than that of regular humans. This not only accustomed future surgeons with functioning bodies, but also presented the possibility to observe how they worked. “And you said that you are transporting them safely to the university?” James inquired, as they were walking down a clean, white corridor. “Who would take on such a task?” From the whispering that followed his question, he recognized that other members of this party were wondering the same thing. “I’m happy you asked, sir,” their guide smiled, turning into a spacious corridor with a chequered floor and tall windows. The light inside was dyed by colorful stained glass images depicting important concepts and personas from the history of medicine. “Thankfully, London has a varied population and the recruitment was not difficult at all. Some are even working today,” he explained. Until a few years ago the Jews enjoyed a growing tolerance and some even worked in Parliament, but with the Plague it all changed. From just a few pieces of gossip, to then hateful articles in the newspapers, the Jews became suspected of causing the horrible illness in an attempt to bring the Messiah to earth. Many claimed they were just as depraved as the Johners. Because of the hostile attitudes, most of the Jewish population in London started keeping to themselves, moving into particular districts, even though it was not enforced by law. They still could practice their religion legally, but all persons of Jewish origin have been abolished from public functions. This once, James had to agree with Juanita. “That does sound extremely dangerous. What if they decide to release the undead in the city. Somewhere in the Christian districts. You don’t know what to expect of these people!” he said, extremely worried. Police reported numerous conflicts between Jews and Christians, especially in less affluent areas. Lord Barnett lobbied to pass a law constricting the former to Bylondon, parasitic districts growing on the outer side of London’s protective walls. This suggestion didn’t go through in the parliament, but still gained more support than Barnett’s quiet advocacy of Johners. “I just want to raise the issue,” murmured James, pouting a bit. “Or allow your daughter to marry one, right?” James smiled with a bit of satisfaction, straightening his back and walking behind the professor. His opponent drew in a deep breath, speechless for a short moment. “I would not, because she will marry her social equal! You know very well a shopkeeper or sailor wouldn’t be good enough for her either!” he spat. “I’m sure the men we recruited are quite well adjusted to polite society!” the young professor said, trying to lead them further down the corridor. He sped up to open a large, wooden door. “I think you will want to use this menthol salve under your noses,” he proposed, opening a small jar and smearing a little over his upper lip. Why? Does it smell of ‘Jew’? James thought, but managed to keep it to himself while doing as the professor suggested. The salve stung his skin but it was bearable. A thin hand brushed along his cheek. “Absolutely. I would not let anyone disrespect you, Lady Shelley!” His voice eager, even though they were on different sides when it came to discussion. James knew the older man was a widower, but apparently, Lady Hunt was not interested, as her delicate arm encircled his own. “That is too kind, Lord Meldrum. Thank you.” The professor pretended not to listen and led them through a reeking corridor. James tried not to think about the cause of the putrid smell, but in those times, hardly anyone was spared from encountering human cadavers. “The morgue is to our left, hence the smell,” he explained, leading them to a large door on the right. “This is the so called ‘Great Prosectorium’. Several autopsies and surgeries can be performed at the same time,” he said with enthusiasm, leading them to a large hall with tall, narrow windows, which reminded James of a chapel. From wooden beams hung banners depicting human body parts, cross-sections and skeletons. On the wall opposite them, there was a long, wooden plaque with the motto of St Catherine’s: “A conscious mind knows no boundaries”. There were several operating tables made of shiny steel, large enough for a few people to use at once, each equipped with a standing lamp resembling a giant rotten flower. Its thick shaft was made of dark wood and strengthened by several iron braces. Black cables grew over it like a wild creeper, going all the way up to the massive circular shade hanging over the tables like over mature fruit. Two moving bodies laid on the tables, tightly bound with steel cuffs and leather straps. Lady Shelley made an inarticulate noise and held onto James a little stronger as if fainting. He felt sorry for her and patted her hand in a delicate manner as they walked along the long wall. “Is this how you keep them?” James asked. “Will they not get free somehow?” asked another member of the group. “Oh no, that is out of the question”. “We just have to hope that the security at the university is very tight…” he said, aiming his comment at the professor. “It is, and those rooms are secured by several doors and special locks,” he explained as a small door on the other side of the hall opened to reveal a female zombie in rags being led into the room by a catchpole. The rod was about 5 feet long, which allowed a uniformed man to avoid the creature’s claws and teeth. The technician was dressed in a black set of pants and shirt, additionally covered by a leather apron. He was bald, tall and muscled. There was something almost painfully familiar about his strong form. It took another glance, as James wasn’t sure at first, but when he realized who he was looking at, his mouth fell agape, as if he had seen a ghost. Momentarily, all his insides shrunk and he felt hot and cold at the same time. Ira Russell, the man who had helped him retrieve the treasure from his mansion, the man who had burnt his face, the man who had taken his virginity… was leading the zombie to a free table, his gaze fixed on the floor. James felt an insane urge to touch him, but instead, he kept staring as if something had screwed his feet to the black and white tiles… When did this turn sour?